OVERLAND PARK, Kan. — The race to the start of the high school football season is on. We're counting down the 10 best teams in the metro area. Of course, with high school football, it's all subject to change. What doesn't seem to change is the notion that the hardest working teams across the Kansas City metro always seem to rise to the top. 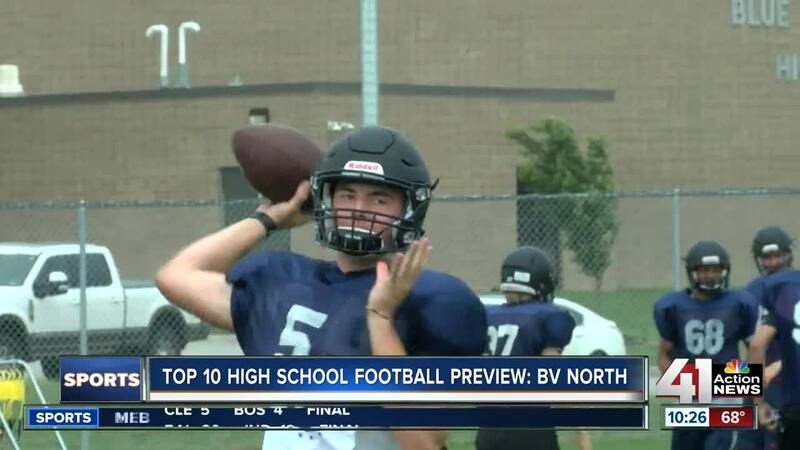 The Blue Valley North Mustangs can certainly be described as one of the hardest working teams around. Head Coach Andy Sims is heading into his sixth season leading his Mustangs team. 2017 was arguably his finest coaching performance to date. He led Blue Valley North to a Kansas Class 6A State Championship defeating Derby 49-42 in the title game. That's impressive considering the team lost three of their first four games to start last season. However, the Mustangs bounced back, finished the regular season at 4-4 and rattled off five straight playoff wins to claim the title. While there are certainly lessons to learn, on both sides, win or lose, 2018 is a brand new season. "You focus on each and every year. And, you know, each year is gonna bring its own challenges," Sims said. "I know there's a lot of coaches out in the state and across the metro that think, this is their year. And, on paper, it should be. But, there is no script for football. And so, things change." Despite Coach Sims being cautiously optimistic about this season, by all accounts, the Mustangs should have another fantastic year. The team is led by standout senior quarterback Graham Mertz who's already committed to Wisconsin. Most players in his position, having won a state title the previous season and committing to a major division one school would take it easy in their final year. However, Mertz is hungry to have his best season yet. "It's what I love to do. I've been playing it my whole life. It's my senior season. I wanna have a great time. So, I'm pumped for it," Mertz said. The Mustangs start their season with a home game against four-time Kansas Class 4A-D1 state champion Bishop Miege on Aug. 30. Blue Valley North looks to avenge last year's 33-14 loss at Bishop Miege. The players are ready for the challenge that awaits week one. "It's gonna take everything we got. I mean, we gotta come out hot from the start," senior free safety Kendall Hargens said. "They're a really good team. They've got some good players. They've got some good receivers. And, we've got a good defense. And, we've got a good offense this year. So, it's gonna be a battle."